Last year, the 96,000 plug-in electric cars sold in the U.S. represented a bit more than half a percent of the total market of 16.5 million vehicles. Market share is a good statistic: It’s useful, and easy to track. But we need to piece together the relationships between vehicle price, type, and market share, to gain a fuller sense of the electric-car landscape. W. Edwards Deming–the late American statistician revered in Japan for his philosophies about product quality–famously said, “There is no substitute for knowledge”. He meant that while it’s important to know the facts, it’s even more important to know their context, which can tell you how to interpret the facts. 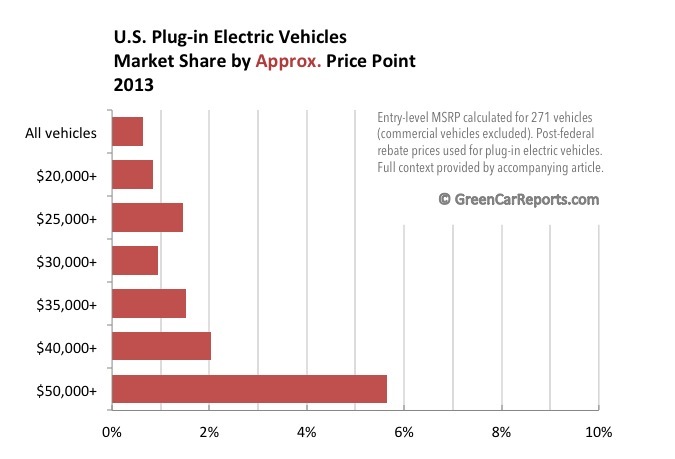 So, how did plug-in electric vehicles do compared to similarly priced vehicles? Light trucks (crossovers, SUVs, and pickups) make up almost half the U.S. market, but the sole electric vehicle in those categories is the Toyota RAV4 EV – a low-volume compliance vehicle. So is it reasonable to include truck and SUV sales in the calculations?